Incredible 5 bedroom 5. 5 bathrooms in the twisting towers of grove at grand bay located in coconut grove. Unit features 12 ft high ceilings, 12 ft deep terraces overlooking the marina and beautiful summer kitchen. Amenities include rooftop swimming pool and swimming pool and garden on the great lawn, private elevator for every residence, butler services, chef onsite and more! 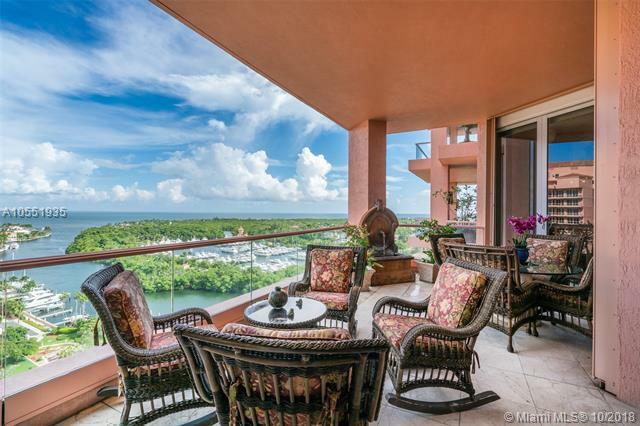 Best line in the entire tower with unobstructed views of the coconut grove marina!! This residence features private entrance, 12 ft high ceilings, floor to ceiling windows/doors large balcony perfect for a full dining and sofa set. Gorgeous marble kitchen with wolf appliances including an integrated coffee maker, double oven and gas stove. Large master bedroom with his and hers closet, double sink and separate tub and shower. Be the first one to own this amazing unit! Remarkable penthouse unit on the 15th floor at the gables club. Breathtaking eastward views of downtown miami, cocoplum marina and biscayne bay, one of the best in the building! Spacious open floor plan with great room featuring a built-in bar, marble floors, impact picture windows with sliding doors to oversized balcony. Enjoy your morning coffee or mid-day meals with with a view in the kitchen with breakfast nook that maximizes the outstanding views of this one-of-a-kind penthouse. First-class building amenities include full-service restaurant & bar, salon, spa, putting green, 2 pools, sauna, hot tub, 24-hour concierge, valet, gated entry to grounds. This unit comes with 2 parking spaces and storage unit. The 3rd bedroom is currently being used as a den. Must see! Beautiful corner unit with spectacular views of sailboat bay. Wide & spacious wrap-around balconies. Nine foot ceilings with floor-to-ceiling sliding glass doors. Marble throughout. Large kitchen with kitchenette with views of the bay and the gables. Master bedroom with great views of the bay & large walk in closet. Spacious master bathroom with jacuzzi. 2 pkg. Spaces, a/c storage locker, double tennis courts, half basketball court, full gym, olympic size pool, gazebo for grilling & private parties, children's playground and dog walk with luscious garden for relaxing, strolling or walking pets. Across from fresh market & walking distance from shops and restaurants. 24 hr. Concierge, valet and security. Live the coconut grove lifestyle in this exceptional boutique condo! Two units combined create a spectacular water-front unit in exclusive grove isle. Enjoy the lifestyle of the small, quaint island just off of coconut grove in grand, luxurious spaces. Magnificent views throughout, marble flooring, master suite with a unique additional room, ideal for a gym, sitting, reading, entertainment area or home office and a master bathroom with spa. You can add your own finishing touches but overall magnificent and a spectacular find! Great schools and fabulous common areas, gym and pool. Nearby boat slips in grove isle marina or in nearby marinas coral reef yacht club, biscayne bay yacht club, monty's, dinner key, coconut grove sailing club. Views**views**views. See it all from here. Unobstructed water views. Miami skyline views. Sunrises. Sunsets. Coconut grove. Coral gables. Key biscayne. And miami beach. Huge corner 3 bedroom. Enormous living area with floor to ceiling glass opening to your spacious balcony. Fully renovated and upgraded. Marble floors and exquisite tile work. Custom woodwork throughout. Renovated kitchen and matching cabinetry. Ss appliances with dual wall ovens. Eat-in bar perfect for entertaining. Designer lighting and ceilings. Den/office/4th bedroom off the kitchen w/ sunset & marina views. Separate dining area with access to the balcony. Very large master suite with huge walk-in closet & en suite bath with his/her vanities. Jacuzzi & glass shower. Private master bedroom balcony. This professionally designed, extraordinary corner-unit with panoramic views of biscayne bay offers over 2,600 sq. Ft of custom opulence. Whether you're looking for a permanent residence or seasonal retreat this move-in ready, entertainers delight boasts a spectacular master suite, with spa-style master bath lined with carrara marble, large second bedroom, converted third bedroom, which expands the main living space, home office. A gourmet kitchen equipped with snaidero cabinets, ceasarstone countertops, and a full suite of miele/sub-zero appliances. The great room is perfect for all occasions with a formal dining area, living room with built-in bar and sitting/tv room. A true jewel in the crown of luxury awaits your arrival. You will never want to leave home. This 3 bdrm, 3 bth luxury 2969 sf condo has it all. From a private elevator enter your luxurious home. High impact floor to ceiling windows and breathtaking unobstructed views of biscayne bay and brickell. A gourmet chefs kitchen, a grand master suite with balcony and custom walk in closet and marble bathroom. Add valet, hairdresser, spa, bar, golf and tennis and a boat dock its an ideal space. Seller financing available. Spectacular renovated townhouse in the highly sought-after guard gated waterfront community of l'hermitage. This tri-level villa offers a sleek modern open kitchen with top of the line appliances, all new impact windows/doors, elevator,luxurious bathrooms & a spacious master suite with volume ceilings & ample closet space. The first level consists of a 1bd/ba + a large sitting room which would be an ideal media room. The second level offers the open eat in kitchen, dining, living room & a screened in terrace. There is also a secondary bed/bath. The master suite and 4th bedroom are on the third level. 2-car garage and a carport. Live the s fla lifestyle in l'hermitage with its amenities & its proximity to the best schools, the grove, downtown miami & brickell ave.